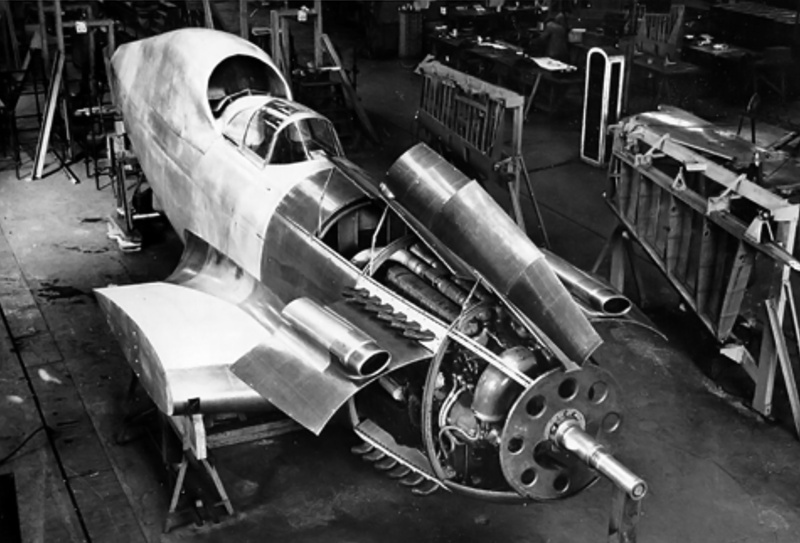 Starting around 1938, Hispano-Suiza began to halt development of its other aircraft engines to focus on its latest V-12, the 12Z (Type 89). The 12Z drew heavily from the Hispano-Suiza 12Y but had many improvements, including two-speed supercharging and four-valves per cylinder actuated by dual-overhead camshafts. France was in desperate need of high-powered aircraft engines to keep its air force comparable to those of other European nations during the build-up to World War II. The 12Z was developing 1,400 hp (1,044 kW) at 2,600 rpm when France surrendered in June 1940. 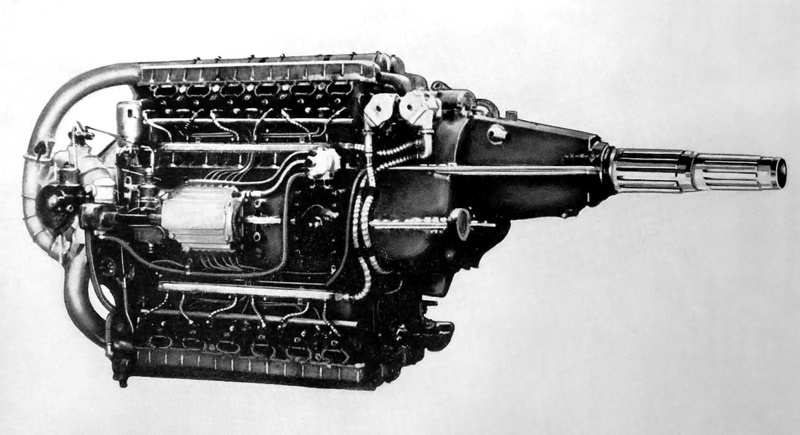 The Hispano-Suiza 24Z incorporated the improved features of the 12Z engine but was very similar to the 24Y. Note the high position of the propeller shafts to accommodate a cannon mounted between the upper cylinder banks and firing through the propeller hub. The magnetos for the right side of the engine can be seen mounted to the propeller gear reduction housing. 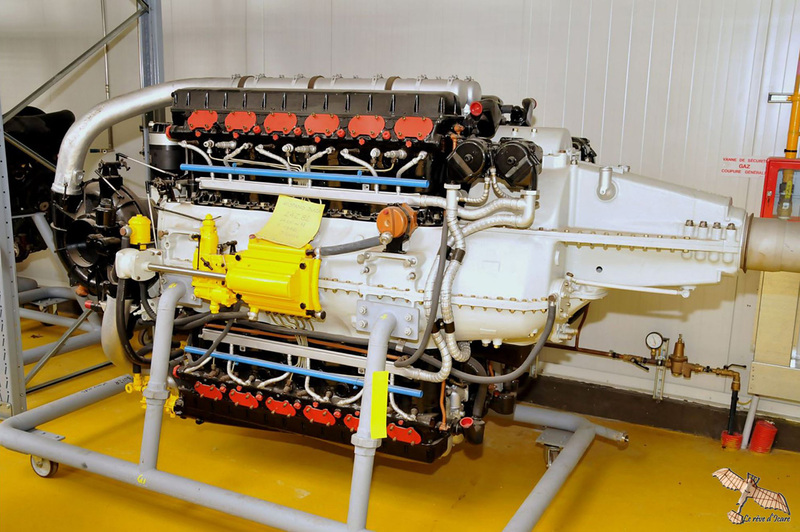 One of the engine programs that was suspended because of the 12Z was the Hispano-Suiza 24Y: a 2,200 hp (1,641 kW), 24-cylinder H engine utilizing many 12Y components. Not long into the 12Z program, engineers started to wonder what level of performance could be achieved by a 24-cylinder engine using 12Z components. In 1943 and under German occupation, development began on the Hispano-Suiza 24Z (Type 95) engine. The 24Z had the same vertical H-24 configuration as the earlier 24Y with two cylinder banks situated above crankcase and another two cylinder banks below. The two-piece crankcase was made from aluminum and split horizontally. A crankshaft served each upper and lower cylinder bank pair. Each one-piece crankshaft had six-throws, was counterbalanced, and was supported by seven main bearings. The pistons were connected to the crankshafts via fork-and-blade connecting rods. The crankshafts, connecting rods, and pistons were the same as those used in the 12Z engine. Each of the 24Z’s four cylinder banks was made up of a six-cylinder block with an integral crossflow cylinder head. The two intake valves and two exhaust valves for each cylinder were controlled by separate overhead camshafts. The camshafts were driven from a vertical shaft at the rear of each cylinder bank. The cylinder banks and their valve train were from the 12Z engine. Each left and right half of the 3,600 hp (2,685 kW) 24Z engine could operate independently of the other half. Note the intake manifolds routing air from the supercharger to the cylinder banks and the drive shaft for the fuel injection pump extending from the rear of the engine. Two superchargers were mounted at the rear of the engine with their impellers parallel to the engine’s crankshafts. Originally, single-speed supercharges were used, but these were later replaced with two-speed units. At low speed, the supercharger’s impeller spun at 6.72 times crankshaft speed. At high speed, the impeller spun at 9.52 times crankshaft speed. Supercharger speed change and boost control were automatic. Separate intake manifolds led from each supercharger to the inner side of the upper and lower cylinder banks. Mounted on each side of the crankcase was a fuel pump that injected fuel directly into each cylinder. Each fuel pump was driven via a shaft from the rear of the engine. The two spark plugs per cylinder were positioned below the intake valves. The spark plugs for each upper and lower cylinder bank pair were fired by two magnetos mounted to the propeller gear reduction case. The front of each crankshaft engaged a separate propeller shaft at a .44 to 1 gear reduction. The two propeller shafts made up a contra-rotating unit. The 24Z was not built with a single-rotation propeller shaft. The engine had provisions for a cannon to be mounted between the upper cylinder banks and fire through the hollow propeller shaft. Each upper and lower cylinder bank pair on the 24Z constituted a 12-cylinder engine section, and each engine section could operate independently of the other. The Sud-Est SE 580 under construction with the 24Z engine installed. Note the supercharger intake on both sides of the cowling. Also note the upper and lower row of exhaust stacks. The scoop behind the cockpit was for the radiators. The Hispano-Suiza 24Z had a 5.91 in (150 mm) bore and a 6.69 in (170 mm) stroke. The engine’s total displacement was 4,400 cu in (72.10 L). The 24Z produced 3,600 hp (2,685 kW) at 2,800 rpm for takeoff. This power was achieved at an over-boosted condition of 7.7 psi (.53 bar); normal boost was 7.0 psi (.49 bar). Max power with low-speed supercharging was 3,200 hp (2,386 kW) at 2,800 rpm at 8,202 ft (2,500 m). Max power with high-speed supercharging was 2,640 hp (1,969 kW) at 2,800 rpm at 26,247 ft (8,000 m). The engine’s normal rating was 3,000 hp (2,237 kW) at 2,600 rpm at 8,202 ft (2,500 m) with low-speed supercharging and 24,606 ft (7,500 m) with high-speed supercharging. The 24Z’s cruising power was 1,500 hp (1,119 kW) at 2,100 rpm at 9,843 ft (3,000 m) with low-speed supercharging and 18,373 ft (5,600 m) with high-speed supercharging. The engine had a specific fuel consumption of .48 lb/hp/hr (292 g/kW/hr). The 24Z was 10.72 ft (3.27 m) long, 4.27 ft (1.30 m) wide, 4.54 ft (1.39 m) tall, and weighed 3,197 lb (1,450 kg). World War II hindered the 24Z’s construction. The engine was first run in 1946, and it was exhibited at the Salon de l’Aéronautique (Air Show) in Paris in November 1946. Bench tests of the 24Z revealed some serious issues, the extent of which have not been found. In September 1947, the engine’s compression was lowered to 6.75 to 1 from its original value of 7.0 to 1. Perhaps this change was an attempt to cure issues with detonation. Later, the gear reduction failed while a 24Z was under test, destroying the engine. The 24Z’s prime application was the Sud-Est* SE 580/582 fighter that was designed during the war. However, issues with the 24Z resulted in the substitution of an Arsenal 24H engine for the SE 580. The SE 580 itself was later scrapped before the aircraft was completed. Many other projects, mostly flying boats and transports, were proposed with 24Zs as their power plant. None of these projects made it off the drawing board. 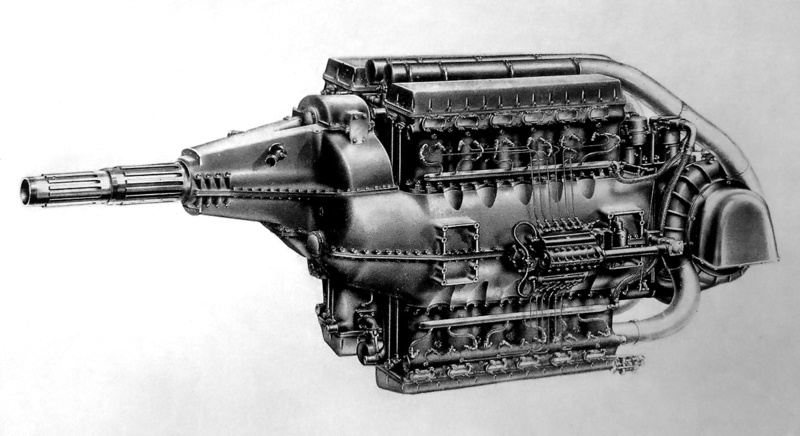 A further Hispano-Suiza proposal consisted of coupling two 24Z engines together to create the 48Z (Type 96) engine. In this configuration, the propeller shaft of the rear 24Z engine section passed between the upper cylinder banks of the front 24Z engine section and extend though the propeller shaft of the front engine. The rear 24Z powered the front propeller of a coaxial contra-rotating unit, while the front 24Z powered the rear propeller. The 48Z would have used four turbosuperchargers—two mounted near the front of the engine and two mounted at the rear. The 48-cylinder 48Z engine displaced 8,800 cu in (144.20 L), had a takeoff rating of 7,200 hp (5,369 kW) at 2,800 rpm, and produced 5,200 hp (3,878 kW) at 13,123 ft (4,000 m). Like many large engine projects at the dawn of the jet age, the 48Z existed only on paper. With the 24Z’s developmental issues and no tangible prospects for installation in an aircraft, the engine program was stopped in 1948. At least two 24Z engines were built, but probably not many more. One engine survives and is preserved in the Musée de l’Air et de l’Espace in le Bourget (near Paris), France. *The SE 580/582’s development began at what was Dewoitine, which had been nationalized into SNCAM (Société nationale des constructions aéronautiques du Midi or National Society of Aircraft Constructors South). SNCAM was absorbed into SNCASE (Société nationale des constructions aéronautiques du Sud-Est or National Society of Aircraft Constructors Southeast), which is often shortened to just Sud-Est. This entry was posted in Aircraft Engines, Post World War II, World War II on 13 February 2016 by William Pearce. Was it planned for the pilot to be able to make the 24Z run on just twelve cylinders? Wouldn’t the performance of the engine be decreased by running on only half of the available cyclinders? Yes, running on just half the engine would definitely decrease the engine’s performance. However, having the engine “halves” operate independently of one another created many advantages too. If part of the engine were damaged, that section could be shut down, losing 50% of the engine’s power rather than 100%. Almost all of the coupled engines had this capability (DB 606, Menasco Unitwin, FKFS A C and D, Breguet-Bugatti Quadimoteurs, Fariey Monarch, etc). A good engine section can also be shut down to extend an aircraft’s endurance and possibly range; Fairey Gannets did this with their Double Mamba engine. It is a similar concept to P-3 Orions shutting down two engines to increase their loiter time.